Desiree Marie Andrews, 507 Tilford Court, Woodbury, was charged with DUI and Violation Of The Implied Consent Law on Aug. 16 by Woodbury Police Chief Kevin Mooneyham. Andrews allegedly drove a 2010 Hyundai Accent to Fred’s Department Store, got out of the vehicle, left the engine running, and got into another car which did not belong to her. When asked what she was doing, Andrews stated she had lost her keys and couldn’t find them. She refused to submit to a blood test. Bond was set at $2,500. Initial court date is $2,500. • Jamie Edward Harper, 5167 Eatons Creek Rd., Nashville, was charged with Public Intoxication on Aug. 19 by Cannon County Sheriff’s Deputy Doc Smith. Deputy Smith was dispatched to an address on Judge Purser Hill Rd. following a request for officer assistance. Upon arrival he found Harper sitting in the back seat of the homeowner’s vehicle. Harper appeared to be intoxicated. He was unable to stand, his speech was slurred, and he did not know his location. He was placed under arrest and transported to the Cannon County Jail. Bond was set at $500. Initial court date is Sept. 11. • Kimberly Lynne Markum, 921 Reed Court, Woodbury, was charged with Driving While License Suspended on Aug. 17 by Woodbury Assistant Police Chief Lowell Womack following a traffic stop in the parking lot of Fred’s Department Store. A release citation was issued. Initial court date is Sept. 18. 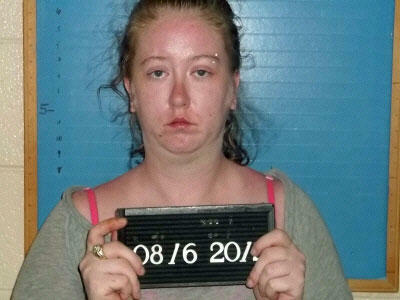 • Anna Claire Byers, 433 Ivy Bluff Rd., Woodbury, was charged with Driving While License Suspended and Leaving The Scene Of An Accident on Aug. 16 by Cannon County Sheriff’s Deputy Jordan McGee. On or about May 14, 2012, Byers was allegedly the driver of a vehicle involved in a traffic accident onJudge Purser Hill Rd.causing damage to a driveway and mailbox. She left the scene of the accident without notifying law enforcement. Her driver’s license was suspended. Initial court date is Oct. 2. • Mandi Mathews, 108 East High St., Woodbury, was charged with False Report on July 31 by Cannon County Sheriff’s Deputy Eric Moss. Mathews stated she was the driver of a vehicle involved in a crash when she knew that Benjamin Roberts was the driver. Bond was set at $3,000. Initial court date is Sept. 11. • Thomas Avent Muncy, 1298 Preacher Spry Rd., Bradyville, was charged with Possession Of Drug Paraphernalia on Aug. 21 by Cannon County Sheriff’s Deputy Steve McMillen. While assisting the Department of Child Services with a welfare check of the children, four smoke pipes used to inhale or ingest drugs we observed lying in plain sight in a bedroom occupied by Muncy. Muncy admitted to ownership of the pipes. Bond was set at $2,000. Initial court date is Sept. 11. • Jack Hollandsworth, 522 McFerrin St., Woodbury, was charged with Driving While License Suspended by Woodbury Patrolman Chris Brown following a traffic stop in the parking lot of Rite-Aid. A release citation was issued. Initial court date is Sept. 18.